Seasoning Mix for Mexican Chicken. 1 Preheat oven to 180ºC (160ºC for fan oven), Gas Mark 4. Do not exceed this temperature. Remove and unfold the cooking bag from top of the sachet, keeping the red tie for later use. 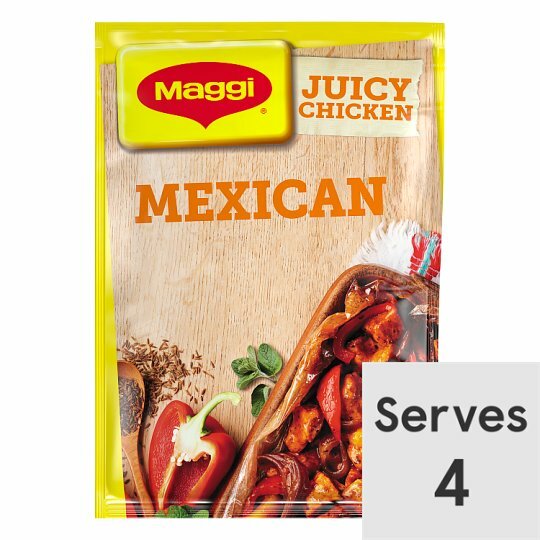 Add 4 x 150g diced chicken breasts, 1 large finely sliced red onion, 1 large, sliced red pepper and 1 large, sliced yellow pepper into the bag. Add the seasoning from sachet into the bag. 3 Cook for 45-50 minutes. Remove from the oven, leave to stand for 2-3 minutes before opening - the steam will be very hot. Ensure that the chicken is fully cooked through and piping hot. Serve the juicy chicken with steamed rice and sweetcorn - see our serving suggestion to the left.